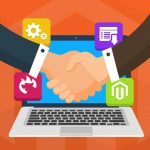 The tool described in the following post essentially improve the existing shopping experience of Magento 2 by providing more flexible delivery conditions. By extra flexibility we mean the ability to select the exact delivery date and leave various comments. As a store manager, you can also set some specific conditions that should be met. In the following post, you will find the description of core extension’s features as well as a tutorial to its backend and frontend. The MageDelight Delivery Date Magento 2 module adds an additional layer of flexibility for both customers and administrators. As a Magento 2 backend user, you create special time slots for delivery that customers can select on frontend. The new functionality is available via a tiny calendar option that is intuitive and informative. To make the feature even more flexible, the MageDelight Delivery Date Magento 2 extension adds a comment box and the ” Call me before delivery” option. While the first one allows to type comments right on frontend, the second one is designed to provide all the necessary information by phone. As a result, a customer doesn’t need to create any additional notes: you will have to contact with him directly. And if plans are change, your client can simply change the delivery date even after the order is placed. Of course, this is not the most admin-oriented option as it often provides additional headaches, but the MageDelight Delivery Date Magento 2 extension really knows how to make buyers more loyal. 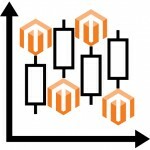 As for admin oriented features, the module allows to set unique price for each day of shipment or delivery. You can either create holidays and cancel delivery for them or increase a price of delivery for these days. 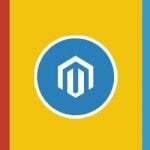 At the same time, the MageDelight Delivery Date Magento 2 extension provides the ability to set the cheapest price for the date which is the most convenient for you. This is a strong motivation for your buyers to select this exact date as a delivery date. At the same time, week-off days and special day can be created and managed from backend. The same is about holidays and vacation periods. Before we proceed to the backend exploration note that the MageDelight Delivery Date Magento 2 module adds additional delivery conditions to PDF documents so they can be viewed in order email and via the admin interface. To configure the MageDelight Delivery Date Magento 2 module, go to Stores -> Settings -> Configuration -> MageDelight -> Delivery Date. 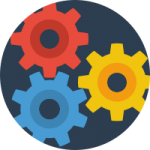 Here, you can find 5 separate sections of settings: License Configuration, General, Calendar view Management, Time Slot Settings, Holiday Management, and User Guide. The first one allows to specify serial key and activation key. You can get both by purchasing the module. Note that without these keys you will never provide customers with additional delivery conditions. As for the General section, it allows to enable the delivery date functionality (must be set to “Yes”). Next, you should specify a label for the delivery date options. 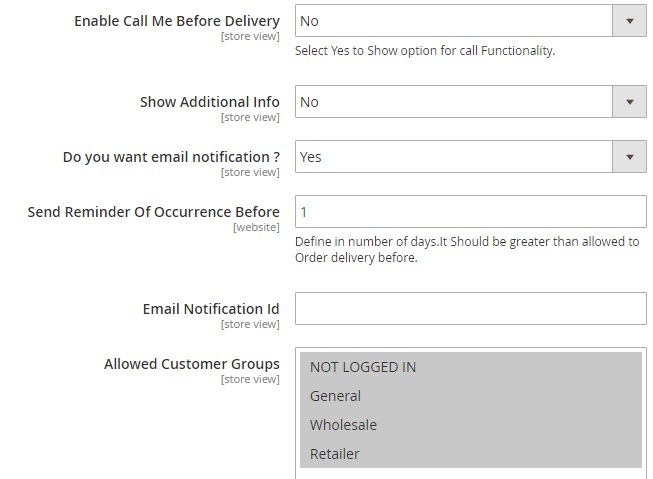 Note that it is also possible to make delivery date mandatory for customers who see the option. 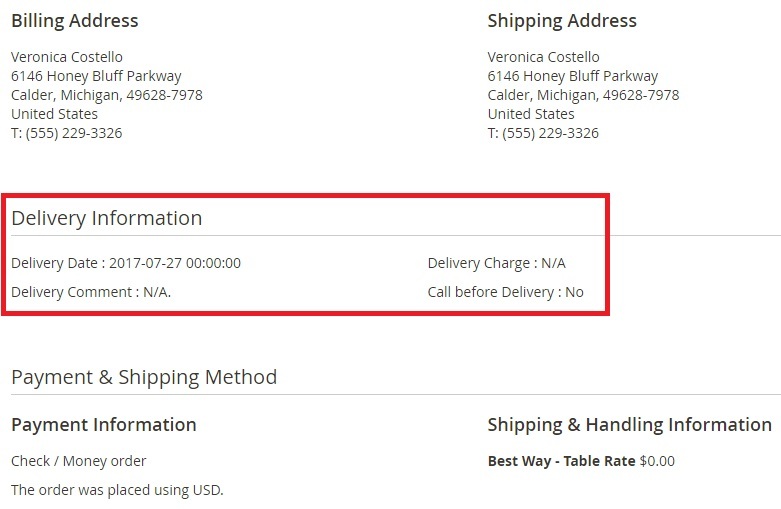 The MageDelight Delivery Date Magento 2 extension also allows to create a custom label for delivery charge. 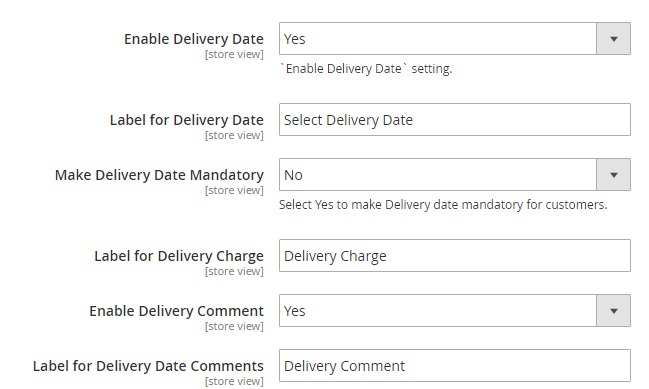 Another option allows to enable/disable delivery date comments. A custom label can be created for this section as well. For instance, you can explain the purpose of the new window (“leave comments to provide us with additional details”). Next, enable/disable the “Call me before delivery” option, show/hide additional information, turn on/off email notifications, and specify the amount of days to send the reminder of occurrence, and type email notification ID. It is also worth mentioning that the MageDelight Delivery Date Magento 2 module allows to show new delivery options for selected customer groups only. Thus, you can leverale the tool for providing business clients with better shopping experience or enable the functionality for all registered customers, motivating unregistered ones to create customer accounts on your store. The third section of settings – Calendar View Management – allows to select a delivery schedule layout. 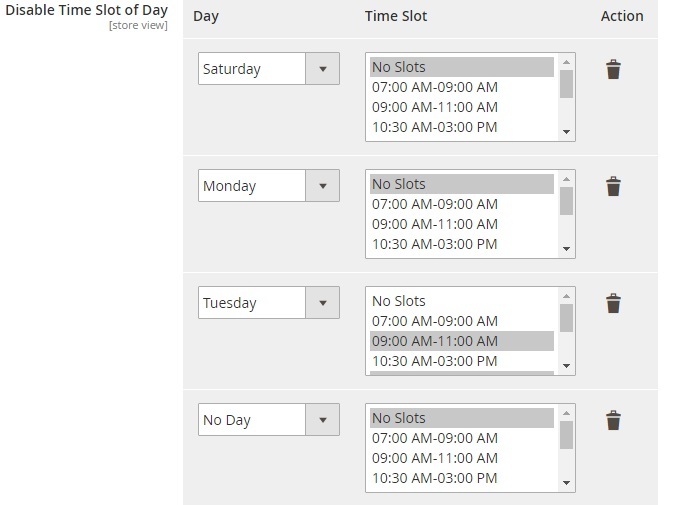 Two options are possible: Calendar View and Time Slot View. Next, you can enable/disable time in calendar. We recommend you to enable this option to provide even more flexible options and make customers more loyal. Besides, the MageDelight Delivery Date Magento 2 extension allows to specify both minimum and maximum intervals of days between the order and delivery date. In addition, you can enable same day delivery and next day delivery (specifying next day delivery charge. Maximum quota per day can be set as well. 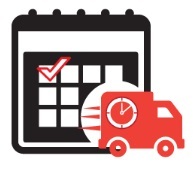 In Time Slot Settings, add the amount of delivery days and a minimum interval of hours between the order placing time and delivery time. Next, add time slots for delivery. 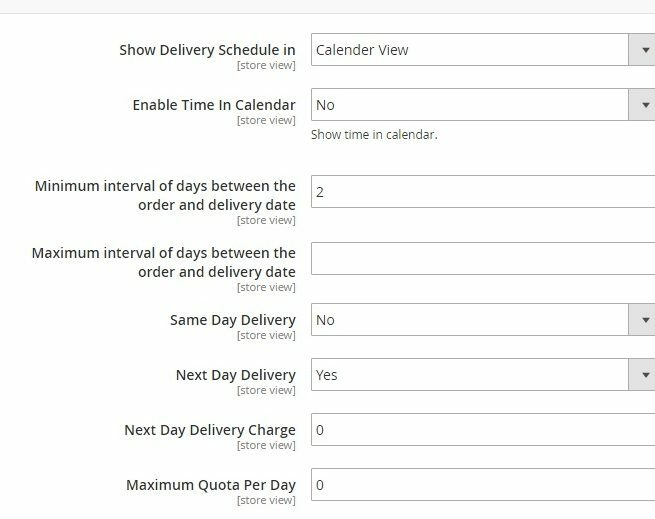 Then the MageDelight Delivery Date Magento 2 module allows to disable selected time slots for particular days or even disable delivery for them (select the “No Slots” option). 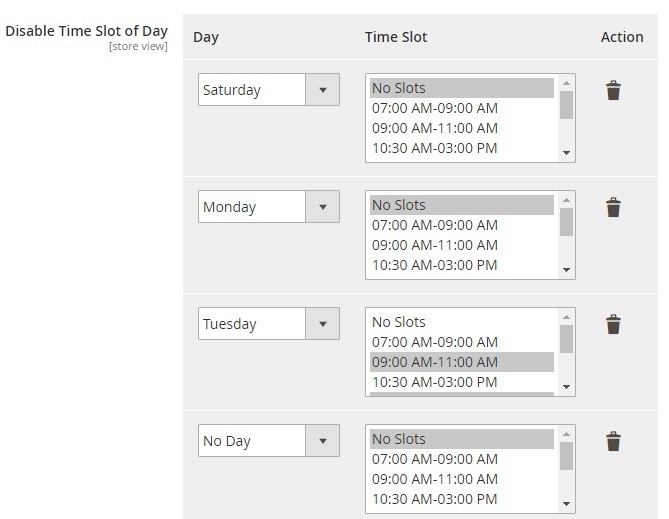 Alternatively, it is possible to disable time slot for particular dates. 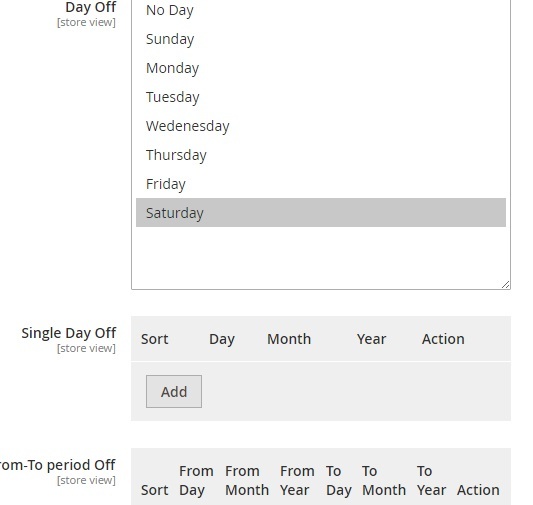 In Holiday Management, select Day Offs, specify single day offs for particular dates of a year, and set periods of vacation when the delivery options are not available. As for the User Guide section, it describes how to add order information to order PDF. As a Magento 2 administrator, you can view the delivery date, delivery charge, delivery comments, and the necessity to call before delivery.